This entry was posted in Day Hiking Tips & Advice and tagged Asiago, Granola, Hiking, Jerky, Lists, Peanuts, Snack food, Snickers, Top 5, Trail Snacks by bhengst. Bookmark the permalink. Unfortunately, I only get real serious about food when backpacking. I have a bad habit of not packing enough food for day hikes — like if it isn’t already in the house, it isn’t packed. But, for in between meals on backpacking trips my standards are: goldfish, fig newtons, and dried mango. I usually bring 5 different snacks for variety. Last trip I also brought dried cherries and peanut butter filled pretzels. 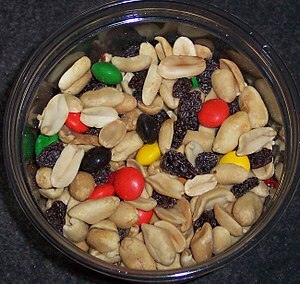 Sometimes I make a really inventive trail mix. Oh, and chocolate should not be forgotten. We’ve been doing cheese and crackers for lunch. I’ve been wanting to bring along some dried fruits lately. Maybe next trip I’ll try some dried cherries. Concentrated cherry juice is actually a good pain reliever. I wonder if dried cherries have the same benefit? Thanks for stopping by and offering your input 🙂 it is always appreciated! I get my dried fruit at Trader Joes (if you have one in your area). The dried Bing Cherries are really good. Yep! I love Trader Joes, did you know they are owned by the same German conglomerate that owns Aldi? Those are all great for the trail. I typically will have a little bit of everything you said. Here are the things that I always carry. GORP either home made or store bought. Some type of Chocolate bar typically a Snickers bar. Those are my favorite things. Thanks for another great post. Thanks for stopping by and offering your input Adam 🙂 it is always appreciated!